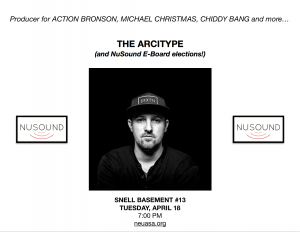 Music Production w/ The Arcitype… & Eboard Elections! We are very excited to announced our final guest speaker, The Arcitype! He is a Boston-based hip hop producer, who has produced for Action Bronson, Chiddy Bang, and Michael Christmas, among others. Get an insider’s view of music production and the industry as a whole! Since this is our final meeting of the semester, we also are having Eboard Elections! We have the following positions open: Vice President & Outreach Coordinator, Treasurer, and Webmaster. If you want to help set up meetings and bring change to the club, the eboard is right for you! Reply to this email if you are interested in any of the positions, or have any questions regarding them. Prepare a short talk for tomorrow about why you want to join the eboard. We welcome all students to apply! Please note that we are meeting in Snell Library #013 instead. We wanted to work around the holiday weekend. Thank you for making this such a successful semester; we had a blast and we can’t wait to bring you more meetings in the fall! 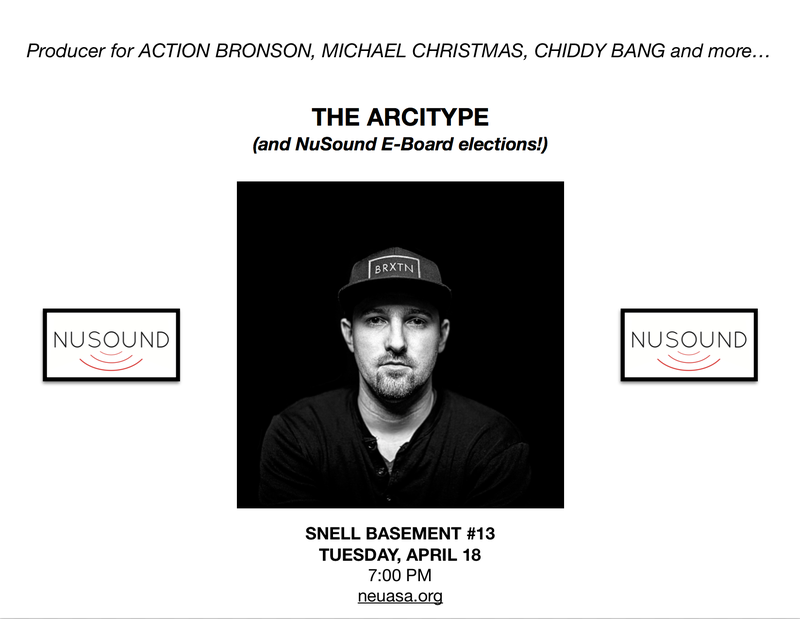 The Arcitype is a Boston based Hip Hop producer who formed his own label, AR Classic Records, and opened his own studio, The Bridge Sound & Stage. He has produced for Action Bronson and many other hip hop artists, MTV series’ MADE, Catfish, and ESPN specials.